Graduation day is an incredibly important milestone in any person�s life. Help the graduate celebrate their special day with a remarkable present! Mrs. Lin�s Kitchen offers a variety of wonderful high-quality gifts to help you commemorate your loved one�s special day! Wish the graduate luck in the future with one of our charming good luck items! The daruma is a traditional symbol of luck and prosperity, while the Maneki Neko is an adorable emblem of good fortune. Bring your friend or family member good luck and prosperity in the form of a figurine, keychain, and much more! 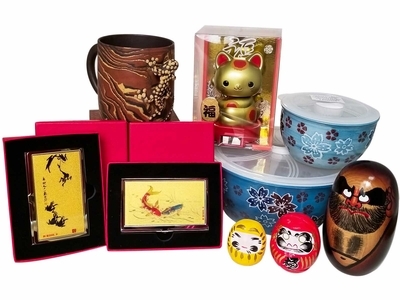 You can even provide the graduate with a useful Maneki Neko and Daruma Card Holder or Gold Business Card Case to wish them success in their future business. Graduating often marks a time of shifting to a new environment. Give functional gifts to help the graduate on their journey of independence, like a Teacup with Infuser and Lid, Yixing Tea Mug, or a Cute Japanese Teacup for when they need an extra boost of caffeine. For graduates transitioning into the workforce, any bowl with lid is perfect for packing lunches to bring to work. Congratulate the graduate with a magnificent and useful gift that they can use for many years to come!